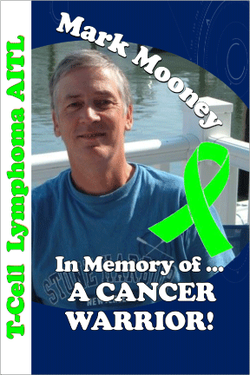 "Mark Mooney was a cancer warrior. He was a three time marathoner and a very active and healthy person until his diagnosis in early 2013 with a rare form of T-cell Lymphoma, called AITL. Through the excellent care of the doctors, nurses, and staff at the Penn State Hershey Cancer Institute, Mark received 6 different treatment regimens including a stem cell transplant. He battled AITL with faith, courage, determination, and a wonderful sense of humor. Supported by loving family, friends, and neighbors, he never gave up hope. Mark passed away in February, 2015. Please help honor his memory and that of other cancer warriors by joining in the efforts to find a cure!."